Similarities and differences between Jamie Farnes’ paper on a unified theory of Dark Matter and Dark Energy published on December 5th, 2018 and my paper on the same topic published six years earlier. Also, a proposal of a test to falsify/confirm my hypothesis. On December 5th, this year a paper was published on arXiv by an Oxford scientist named Jamie Farnes, which has attracted much attention. Reading the paper & articles on it, I was startled to note the striking similarities between his paper and mine that I published in July 2012. I had posted my DM/DE hypothesis on Scribd, blogged about it on my blogspot page a couple of times, created two Youtube videos, published powerpoint presentations, wrote an article on Medium on it, had online discussions with other scientists, emailed several scientists working on DM/DE. My papers on Scribd have been viewed over 50,000 times and my Youtube videos, generated about 11,000 hits. They’re all still available for scrutiny. Links are given at the end of this post. As soon as I read the phys.org report (https://phys.org/news/2018-12-universe-theory-percent-cosmos.html) on Dr. Farnes’ paper, I wrote a blog post (noting the striking similarities) that you can find below this one. Besides emailing to Dr. Farnes, I had also tweeted to him, phys.org and a few others. As can be seen from above, the similarities cover the gist of Farnes’ theory. However, there are some differences as well. My model proposes the continuous creation of negative mass matter in the form of, what I call, spatial perforations. Spatial perforations are somewhat like closed 2-dimensional bubbles in 3-dimensional space. Normal matter is trapped in a closed 2-dimensional bubble, rendering the insides of the bubble (that is 3-dimensional) completely cut-off from the outsides (our 3-dimensional universe). Since the 2-dimensional bubble has a positive spatial curvature (gravity hill) with respect to our universe, they will be gravitationally repulsive with the normal matter (that causes a gravity well) in our universe. This 2-dimensional barrier enclosing the trapped 3-dimensional matter, causes this matter to be not a part of our universe, though technically within it. The only way that we can experience this trapped matter is through its (repulsive) gravitational influence on normal matter. As an aside, I think the only defining characteristic of our universe is that it’s spatially 3-dimensional. Two points can be said to lie in the same universe if there exists an unbroken path, however long (need not be straight) that connects them which does not pass through a region that has a different spatial dimension. Thus points at the two ends of the universe separated by billions of lightyears (with no hope of light ever reaching from one point to the other considering the inflating universe) can still be of the same universe. Yet, a space that is right at the tip of our nose, but fully enclosed in a closed 2-dimensional membrane, will not be a part of our universe. To further illustrate, if the coffee cup weighing around 600 gms that is on my table is suddenly enveloped by a closed 2-dimensional (membrane) bubble, it completely disappears from this universe. No instrument, however sophisticated will be able to detect it apart from its gravitational effect. It’s no longer a part of our universe although the 2-dimensional bubble is technically within our universe. It’s not part of our universe since any path that connects me to my cup must go through the bubble that is 2-dimensional. It literally creates a hole (or perforation) in our universe (this hole should not be confused with a black hole). I will experience this 2-dimensional bubble that has trapped my cup only as an invisible “repulsive force cloud.” Due to the earth repelling it, this force cloud will fall up and stop at the ceiling like a helium balloon. We can know that this “force cloud” exists by observing that the ceiling is now 600 gms lighter. With respect to our universe, this force cloud has truly a negative gravitational mass. Now, how are these spatial perforations (or 2-dimensional bubbles) created? They are created by quantum fluctuations just like elementary particle pairs are created. However, unlike the particle pairs, the spatial perforations have a longer life, since they don’t have an anti-particle that can annihilate it. As soon as they are created, if they are near a massive body like a planet or a star, they get repelled outwards. With the stellar, planetary and galactic dynamics a good portion find their way to the outer peripheries of galaxies where they are met by the perforations that are already (created) there. These growing deposits of perforations create a soft gravity hill (like the circular hills around a crater) at the outer peripheries (galactic halos) of the galaxies. This soft shell of perforations at the periphery is what keeps the galaxy together and the outer stars from flying off. The gravity hill created at the periphery acts somewhat like the greater banking angles on highways, necessary at the outer end of turns to allow for greater vehicular speeds. Within galaxies, these perforations will get deposited in gravitationally neutral spaces such as the Lagrange points. As for Farnes’ model, it too proposes the creation of negative mass matter that is gravitationally repulsive and ends up at the galactic peripheries exactly like my model. But he calls his negative matter stuff as a “dark fluid.” He explains the creation of this dark fluid by “modifying Einstein’s theory of general relativity.” Besides, his dark fluid has a negative mass both gravitationally and inertially. I am very skeptical about this and don’t believe anything can have a negative inertial mass despite a recent discovery (https://news.wsu.edu/2017/04/10/negative-mass-created-at-wsu/) at Washington State University that sensationally reported the creation of ‘negative mass’ Rubidium atoms that appear to exhibit negative inertial mass properties. But if you read their report carefully, it says, “Now when the rubidium rushes out fast enough, it behaves as if it has negative mass.” Behaves as if. Thus, this is not true negative mass, but merely an illusion of it created by manipulating the spin of the rubidium atoms. It is somewhat like throwing a fast spinning top on the floor and seeing it moving towards you rather than away. I assume, this whole confusion arose from the interpretation of the famous equation F=ma. The equation F = m × a is certainly true, but with a small change. It should rightfully be F = |m|× a. That is, only the magnitude of mass is applicable here. I would agree the rubidium atoms had somehow acquired negative mass if they had suddenly “fallen upwards.” But I don’t think that effect was observed in the said experiment at WSU. I also have a problem with Farnes’ labeling of his negative mass stuff as a “dark fluid.” I am not sure if he means the two words in the same conventional sense that we are all familiar with. That is, “dark” as in non-reflecting and non-emitting light, giving a black appearance. And “fluid” as in liquidy. Both these words are misleading. That’s why I don’t like the term “dark matter” either. But I can tolerate it as a placeholder term to describe its observed effects. It’s not dark but rather invisible. Invisible things are not dark but allows light to pass through unhindered. It’s not liquidy either, well, at least not per my hypothesis. I can’t imagine light from galaxies billions of light years away surviving the journey through all that unimaginably vast and dark-fluid-filled space. When he explains the continuous matter creations by “modifying Einstein’s theory of general relativity,” I have alarm bells going off in my mind. Let me say at the forefront that I am biased against MOND and think it is complete nonsense. You don’t have to resort to MOND as an explanation for the continuous matter creation. Einstein’s equations are perfect as they are and requires no modification. My hypothesis also proposes the continuous creation of this negative mass stuff (spatial perforations or 2-dimensional bubbles). But that is through a process akin to the particles created due to quantum fluctuations. This, I think, is a far better way than tweaking Einstein’s equations as you please to explain matter creation at large scales. 1. As I mentioned earlier, the negative mass stuff, like my spatial perforations (and even Farnes’ dark fluid) will deposit at the Lagrange points, where the gravitational influence of nearby bodies balances each other out. I refer to the recent discovery of Kordylewski dust clouds in the stable L4 and L5 Lagrange points of the Earth-Moon system. Each of these dust clouds is more than nine times the size of the earth. Even before the discovery, I had predicted that these Lagrange regions must be replete with spatial perforations (or “dark matter”). The discovery of the dust clouds only heightened my suspicions. The very fact that such large amounts of dust haven’t coalesced and compactified (and become large rocks) under their gravity despite being around for millions of years, points to some repulsive force that’s keeping them apart. I suspect that this is the work of my spatial perforations and that the dust is embedded on the repulsive force clouds resulting from the spatial perforations deposited there. I propose a special probe to be sent to that region of space with a mechanism to entrap an area of empty space in the heart of L4 or L5. When the probe returns to earth, there will be a measurable loss of weight if spatial perforations exist. If it is found that there is no evidence of any negative mass stuff, then my hypothesis is wrong. On the contrary, if the presence of gravitationally repulsive negative mass is confirmed, there will be enormous benefits to humanity. Mining this vast and almost endless supply of gravitationally repulsive stuff can have such tremendous impact on architecture, transportation, aviation, etc. 2. I think primordial negative mass deposits are also present on certain points on earth. Terrestrial locations, exhibiting gravitational anomalies are possible candidates for consideration. For example, the region around Hudson Bay in Canada is a great example where there is a dip in gravity. I realize there are alternate theories explaining this gravitational anomaly, although they have not been proven. Scientists currently believe the magma convection in the Earth’s mantle, combined with a “glacial rebound,” is probably the reason for the gravitational dip around the Hudson Bay. The glacial rebound was thought to have commenced after the melting of the Laurentide ice sheet, which had covered most of Canada during the Pleistocene period. But I think, it is worth examining whether this is caused by vast tracts of primordial negative mass matter trapped under the Precambrian rock that made up the Canadian Shield. The benefits to human life, again, would be staggering. 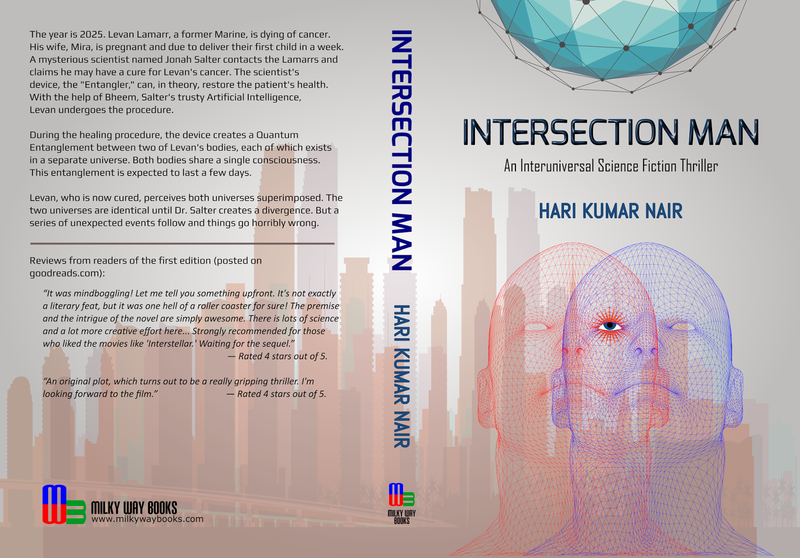 In 2015, I self-published a science fiction novel, "The Intersection Man," in which one of my characters, a scientist, puts forward this exact hypothesis. I explain this in detail in the novel. This paves the way to the artificial creation of something I labeled, Gravitationally Repulsive Medium (GRM). The GRM thus created, causes a revolution in almost all facets of human life, from architecture to aviation and even medicine. Think of floating habitats, tethered cities rising to the thermosphere. My original hypothesis was a bit too ambitious. It tried to explain not just dark matter & dark energy but also went much further. Perhaps that may not have been a good idea. In your article (http://theconversation.com/bizarre-dark-fluid-with-negative-mass-could-dominate-the-universe-what-my-research-suggests-107922) you have claimed this to be your new idea. I contest that claim since the gist of what you claim as “your idea” was first proposed by me back in 2012, as I have already explained. As mentioned in the beginning of this article, I had posted my DM/DE hypothesis on Scribd, blogged about it on my blogspot page a couple of times, created two Youtube videos, wrote an article on Medium on it, had online discussions on science forums, emailed several scientists working on DM/DE. My papers on Scribd have been viewed over 50,000 times and my Youtube videos, generated about 11,000 hits. They’re all still available for scrutiny. Links are given above. In your research on this paper, you surely must have done some Google searches, and it is likely you came across my paper, like the many others who read it. Still, I am not saying you outrightly plagiarized my idea (sure, you might have independently arrived at it), but just saying I got there first. Six years before you did. Currently, I am exploring my legal options to get my due credit for this idea. Startling similarities between my integrated theory on Dark Matter and Dark Energy that was first published in 2012 and a new theory published today!! I am so excited now! I had first published my integrated hypothesis of dark matter and dark energy titled the Perforated Universe Hypothesis in 2012. Today, I read that Dr. Jamie Farnes from the Oxford e-Research Centre has just published (today) a theory that is almost exactly identical to mine. Now, what is this ‘Dark Matter’ and why is it gravitationally repulsive with respect to normal matter? My understanding of General Relativity tells me that (attractive) gravity is the (negative) curvature of space-time caused by matter within our universe. Then, would it be right to assume that matter outside our universe can positively curve our space-time thus causing gravitational repulsion? Therefore Dark Matter could in essence be matter in this universe but not of this universe. To elaborate, Dark Matter could be matter contained in microscopic bubble universes within our own universe. Hence Dark Matter is both outside our universe and in our universe! They are separate universes since they are bounded by spatially 2 dimensional M brane ‘bubbles’ or perforations. Since with respect to our universe, they would be positively curved, these spatial bubbles would be gravitationally repulsive with the normal matter of our universe. In summary this idea, which I call the "Perforated Universe Hypothesis" proposes an integrated explanation for Dark Matter and Dark Energy. Dark Matter as extradimensional matter trapped in "perforations" in our universe's 3 dimensional (excluding time) space, where only the gravitational effects leak through. They are wrapped in closed 2 dimensional M branes, much like fine bubbles. Since their space-time is positively curved with respect to our universe, they would be gravitationally repulsive with matter in our universe. Hence this dark matter would only be present in gravitationally neutral areas outside concentrations of matter such as stars and planets, akin to a foamy but invisible shell around planets, stars, planetary systems and galaxies. They would be exerting a "soft" repulsive force towards normal matter. This explains the presence of dark matter in the halos around our galaxy, whose repulsive push keeps the stars in the periphery within orbits inside the galaxy. Also as the repulsive force that pushes galaxies apart causing the observed accelerated expansion of the universe. Then in 2015, I self-published a science fiction novel, "The Intersection Man," in which one of my characters, a scientist, puts forward this exact hypothesis. I explain this in great detail in the novel. This paves the way to the artificial creation of something I labeled, Gravitationally Repulsive Medium (GRM). The GRM thus created, causes a revolution in almost all facets of human life, from architecture to aviation and even medicine. I had earlier proposed the accumulation of dark matter (GRM) in gravitationally neutral points such as the Lagrange points. The presence of dust clouds at L4 & L5, by themselves, may not point to dark matter, but the fact the dust has not coalesced into a large rock clump does raise questions of some repulsive force acting against the attractive gravity of such a large body of dust (each almost 9 times the size of the Earth). This is especially so since these dust clouds have been around for millions of years. With my limited resources, I tried to simulate a cloud (of well, 4-sided die, each 2 gm) in neutral space using Universe Sandbox2. Each particle (the 4-sided die) was suspended a few 100 meters away from each other. It took about 15 years (simulated) for the dies to come together. I realize that this was only a very rough simulation (may not be very good), but still, I think a proper simulation would reveal that this dust cloud (without any repulsive dark matter) should have clumped up into larger structures due to the attractive gravity. Whereas the continuous accumulation of repulsive dark matter would prevent this clumping and preserve the dust cloud's rarefied dispersion. Just like the dust particles, the dark matter too will be vulnerable to the tugs of the Earth and Moon at the peripheries of the cloud, causing a continuous transit of DM and dust in and out of the cloud. While this may not be a strong supporting phenomenon, this can be explained by gravitationally repulsive dark matter. I had, in my hypothesis, proposed the creation of cosmic rays under certain conditions along with the dark matter. While this stream of dark matter, being gravitationally repulsive, would "fall up," it would tend to take with it cosmic rays as well, accounting for this phenomenon. "Intersection Man" sequel out now on Amazon! 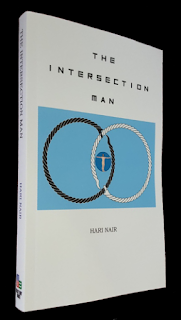 Since publishing the "The Intersection Man" in 2015, I received many emails from my readers enquiring what happens after the cliff-hanger ending of the book. After much dilly-dallying, I started writing the sequel sometime mid-2016. As is often the case, the writing soon took a life of its own and in March 2017, I typed in the concluding line of the novel. I must admit, this gave me an immense sense of satisfaction. Especially since all the loose ends of part 1 was, I felt, satisfactorily resolved in the sequel. The sequel comprised of two parts. In other words, it was a three-part novel if you include the first part that was published in 2015. I decided to split the sequel into two parts since they were set in different time periods. The first round of editing was completed in April 2016. However, this time I decided to get some professional help for a more detailed editing. It took another five months before the complete volume of "Intersection Man" became available on Amazon. If you notice, I decided to drop the definite article, 'the' this time. "Intersection Man" is not merely the sequel but includes part 1, 2 and 3 bundled together in a single volume of 408 pages (135,000 words). To know more about the book, please visit the Milky Way Books website, where you can find a short synopsis. There you may read the first four chapters of the book for free. A link to the Facebook page of the book is also provided there. The Facebook page contains a ton of information and graphics related to the book. The Ebook version of the book, which you can read on your smartphone, tablet or Kindle is only $1. The paperback version can be purchased from Amazon for $17. My name is Hari Kumar and I am from Canada. I am looking at the Dark Matter mystery more from a detective’s perspective than a scientist’s :) . What we seem to know is that the total mass–energy of the known universe contains about 5% ordinary matter, 27% dark matter and 68% dark energy. That is to say, dark matter should account for more than 5 times the mass of normal matter that makes up the visible stuff. Yet it has not been detected on Earth even with our most sensitive dark matter detectors such as the LUX detector. Moreover, from what I have read so far, I get the idea that scientists are certain of the presence of Dark Matter in halos of galaxies, yet am I right to say that it has not yet been detected within the galaxies themselves? Could it be possible that the LUX detectors could not detect Dark Matter simply because there isn’t any in the vicinity of our Earth? That would essentially mean that Dark Matter distribution is perhaps non uniform across our galaxy. Since it seems to be localized in galactic halos, and perhaps such regions that are gravitationally neutral (I am not sure I am using the right term here, what I mean is regions of space that have little gravitational influence from other massive bodies, like Lagrangian points) and not in the vicinity of the gravitational field of massive objects, isn't it more plausible that Dark Matter is actually gravitationally repulsive with respect to normal matter? Hence, the place to look for Dark Matter may not be on Earth, but rather in regions of space that are beyond the gravitational influence of massive objects. Even our Sun and planets (including our Earth) may be wrapped by very soft shells of Dark Matter. Since unlike normal matter, which has a tendency to clump together at larger scales due to their gravitational attraction, Dark Matter would be much less dense and dispersed fairly uniformly in the remote intergalactic regions of our Universe. They may be found within galaxies too, but over time they may have a tendency to ‘bubble up’ or ‘bleed out’ to the peripheries of the galaxy due to the dynamics of star motion. Thus a way to test this is to confirm by observation that the presence of dark matter within galaxies may be higher for galaxies that are further away from us. In other words, the closer the galaxy is the greater is the concentration of dark matter in its outer galactic halo and lesser within (Matter and Dark Matter will be more separated). The accumulation of ‘foamy’ dark matter in the peripheries (halos) of the galaxies, would in effect act somewhat like the hemispheric walls of the ‘wall of death’ acts in carnivals and circuses, where motorcyclists have to travel at greater speeds to remain circling inside the sphere and farther away from the centre. The further up they have to move, the greater the speeds they need to maintain. 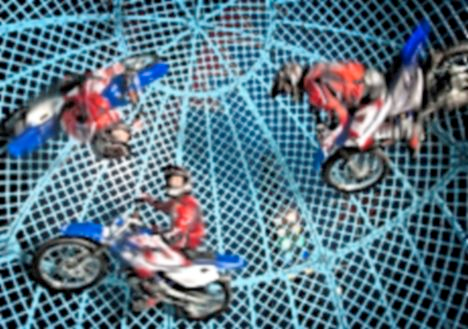 The motorcyclists are like the stars at the outer periphery of the galaxy that are under the influence of the repulsive forces of the dark matter, which forces the stars to speed up to maintain the outer orbits. In the process, these stars may lose mass due to the effects of the dark matter foam, thus causing loose clouds of extremely hot gases in the peripheries. Also these stars are likely to be much smaller than those closer to the galactic centre. These too can be checked by observation. The foamy dark matter’s repulsive push would be proportional to the mass of the normal-matter body that it comes in contact to. Thus it is unlikely to pose much detectable resistance to smaller objects like meteorites and almost no measurable gravitational effects on light. However, bending of light due to dark matter may still be effected due to something similar to optical refraction (due to the layering of dark matter—the finer/smaller bubbles of dark matter is likely to be present closest to the surface of the massive body. The attached image of the Dark Matter Shell structure would shed more light). This idea of dark matter as space-time perforations (or foam), may eliminate the need for a separate theory of ‘dark energy’ to explain the accelerated expansion of the universe, since the continued accumulation of repulsive dark matter would fuel the observed accelerated expansion. Additionally, the presence of repulsive dark matter from the moment of the Big Bang can also satisfactorily explain why the entire mass of the universe did not collapse back into a Black Hole moments after the Big Bang. In fact, I think it is more plausible that the exponential expansion immediately following the Big Bang was propelled largely due to this repulsive Dark Matter than any faster than light expansion of space. In summary this idea, which I call the "Perforated Universe Hypothesis" proposes an integrated explanation for Dark Matter and Dark Energy. Dark Matter as extradimensional matter trapped in "perforations" in our universe's 3 dimensional (excluding time) space, where only the gravitational effects leak through. They are wrapped in closed 2 dimensional M branes, much like fine bubbles. Since their space-time is positively curved with respect to our universe, they would be gravitationally repulsive with matter in our universe. Hence this dark matter would only be present in gravitationally neutral areas outside concentrations of matter such as stars and planets, akin to a foamy but invisible shell around planets, stars, planetary systems and galaxies. They would be exerting a "soft" repulsive force towards normal matter. This explains the presence of dark matter in the halos around our galaxy, whose repulsive push keeps the stars in the periphery within orbits inside the galaxy. Also as the repulsive force that pushes galaxies apart causing the observed accelerated expansion of the universe. For more details see the link below. An image of the typical structure of a Dark Matter shell around a massive object is also attached. I have been saying all along that Dark Matter, due to its unique property of being gravitationally repulsive, forms a shell around galaxies and other massive objects. The report here (http://www.scientificamerican.com/podcast/episode/dark-matter-shell-saved-wannabe-galaxy/) describes just such a shell around the dwarf galaxy called the Smith Cloud, which scientists say protected it during a collision with the Milky Way millions of years ago. If Dark Matter were gravitationally attractive with respect to normal matter, this could not have happened, since then the Dark Matter sheath (and much of the gas in the Smith Cloud) would have been absorbed by the Milky Way (due to its gravitational attraction), during its passage through our galaxy. If the gravitational effect of Dark Matter was attractive in nature just like normal matter, they would also form black holes just like normal matter and the universe would have that much more black holes (since Dark Matter is 5 times as abundant as normal matter). But such additional Dark Matter black holes have not been observed, especially in areas supposed to be dense with dark matter. If Dark Matter were gravitationally repulsive, they can never form black holes and would agree with what is observed--black holes formed by the gravitational collapse of massive stars made of normal matter only. In my previous posts, I have explained the critical significance of 153 in these times. 153 is among the most important ascension numbers and is found in the mystical traditions of many of our religions and encoded into our sacred sites including the Pyramids of Egypt. I don't have an answer to explain the inordinately high frequency of occurrence of this number in the media reports of plane crashes. Coincidence? Perhaps. I am not saying that 153 appeared in the news reports of all plane crashes in the last five years. But 5, I think is too much, especially when this number holds such a mystical significance. I think this number is present very much in our collective subconscious and through its appearance thus, nature is trying to give us a very important message. Something seems to be brewing and these are the reminders. The links to the relevant news reports and some of the doubts that you may have are addressed in the comments on my Facebook page shown above. It would be interesting if the MAS plane reappears on the 15th of March.